We are Brisbane plumbers that specialise in blocked drains. We are an experienced and qualified plumbing service that cleans out drain blockages on a daily basis. 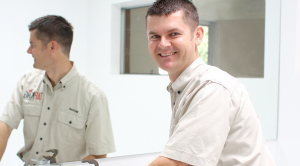 We do not do general plumbing maintenance, but focus on what we do best – clearing Brisbane blocked drains. That way we can help you with our years of experience when it comes to blocked drain solutions. We can solve your problems quickly and thoroughly. We offer you the right advice and solutions that many other plumbers can’t because they haven’t spent their time specialising in this area and investing their money in special blocked drain equipment. We are fully licensed, reliable and experienced plumbers that know your drainage and pipe issues inside out. If you are in Brisbane, you can trust we have the expertise to help you and solve your problems. The biggest plumbing problem in Brisbane is usually a result of a blocked water drain. 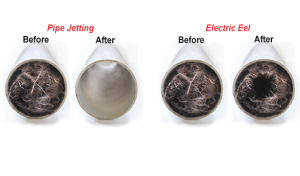 These pipes will need cleaning or servicing by a professional who uses specialist drain equipment such as a high pressure drain cleaner or jet rodder. After a drain camera inspection of your pipes has been carried out our experienced plumber will recommend the best way your storm water drain or sewage line can be cleared. A plumber that is a professional blocked drainage cleaner uses special tools that a general plumber doesn’t have. These include highly specialised equipment such as a CCTV pipe camera that can show you exactly where the blockage is and what is causing it. Such as cracked pipes, tree roots or foreign objects in the drain. A very common blocked drain symptom can be an over flowing toilet or a blocked toilet in Brisbane city. This can be a real problem and make your bathroom unusable if the water won’t flush down the toilet. You will require the services of a fully qualified blocked drain plumber to get the job done efficiently and effectively the first time. We are a mobile plumbing service that carries a complete range of plumbing tools that allow us to cope with all your drainage problems on site. We use CCTV camera equipment at your home to locate and identify the blockage and we clean even the most stubborn of clogged pipes including tree roots and cracked drainage pipes in your home or business. We are the drainage experts in Brisbane and are a member of the Master Plumbers Association. Blocked toilets is a number one call out for emergency Plumbers in Brisbane. We have 20 years experience in drainage solutions in Brisbane and can find the cause of the problem pipe quickly and at an effective cost for you and your family. In Brisbane (The River City) it is very important to have free flowing pipes that drain effectively, otherwise your blocked Drains can lead to flooding which as been seen in Brisbane before where a massive flood was recently experienced. Existing drain blockages and problem pipes were a massive contributing factor to these massive flooding and drainage problems. It is best practice to have your gutters and drains cleared out before the Brisbane storm season arrives. Often home owners will neglect maintenance on their pipes and drains resulting in blocked and clogged drainage systems. Problems like flooding of under ground or subterranean pipes and water ways are frequently connected to clogged or choked up pipes. Often detecting where the blockage is can be a very difficult and expensive process for any home or business. Specialised plumbers will carry a specific set of tools that will locate the block and get the pipes free flowing again without digging up the soil. In nearly all cases this drainage cleaning will unblock the pipes or drains. The major causes for a clogged pipe is tree roots, fat and paper. People often flush or dispose of items down the sewer pipe which are not meant to be there in the first place. Many plumbers try to clean this kind of clog with a device called an electric eel. We tend to use high pressure Jett Rodding as it achieves a much better result. Copyright, Drain Pipe King Brisbane.